The Dodge Viper may have got to the end of its production run, but its still one of the most iconic American sports cars with its huge naturally aspirated V10 engine and 645hp of power. 645hp will probably be enough for most people, but the guys at Calvo Motorsports decided to take one Dodge Viper and add two turbos along with other modifications to be able to max out the engine at 1,700hp (1267kW) with standard 93 octane fuel. 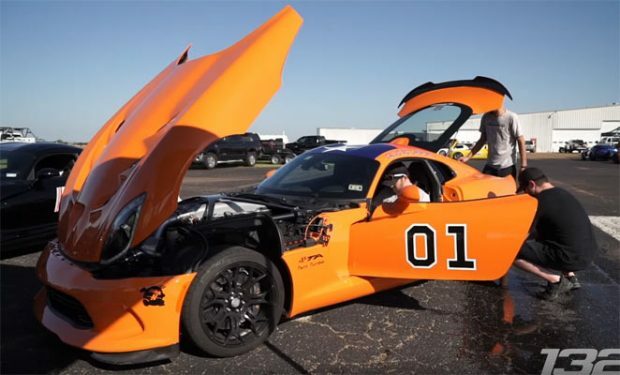 The Dodge Viper was taken down to the Drag 965 Pump Gas Invitational at Caddo Mills, Texas to prove its worth and was able to get consistent speeds of 190mph. With just an added extra bit of ummph in the form of race fuel the Dodge Viper was able to pump out 2,300hp, showing the different performance levels at the least for each fuel type. Check out the full video below to see this mighty machine in action.